After the end of the First World War many memorials were erected across the country in memory of those who had lost their lives in the conflict. In some cases these were ornate public monuments placed in prominent locations in towns and villages. However, there are also many other more simple tablets and panels to be found in churches, schools and other buildings commemorating the loss of local people. The names of those who fell in the Second World War and subsequent conflicts were often added to existing monuments. Alternatively, new memorials may have been created to honour these later casualties. 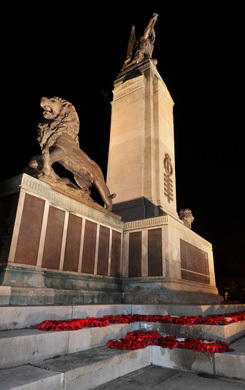 You can search our online database to see the names of those who are remembered on the memorials in Tameside.